Well this week I decided to take it back, way back, to where it all began. You can’t have a Game of the Week without a mention to the game that started it all. 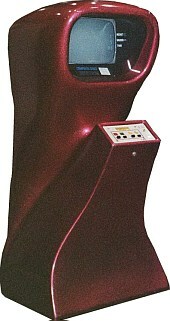 Computer Space was released in 1971 and was the first EVER coin operated arcade video game. The game was created by Nolan Bushnell, who later went on to found Atari with Ted Dabney, and released by Nutting Associates. Computer Space was housed in a unique fibre glass cabinet with a 13″ GE television and did not have a processor at all, inside (due to the high cost of processor chips) was “discrete components” that consisted of transistors and diodes. Computer Space also found it’s way into the movies, first the 1973 film Soylent Green staring Charlton Heston, the film was set in 2022 so presumably it was chosen for the futuristic look of the cabinet, also Sleepers (1973) and Mr Spielberg himself decided to include it in his film Jaws. So I guess it is only right that I mention the game play, in this game you control a rocket ship and have to compete against two flying saucers. The player has to shoot at the two flying saucers while avoiding the returning fire. If at the end of the predefined time limit your score was higher than the saucers, then you got another chance. Not only did you get another go upon winning, but you also went into hyper space, all this meant was the colours inverted, black became white and white became black. Now that’s cosmic!!! Unfortunately, many found the controls too difficult, and Computer Space was very short lived.